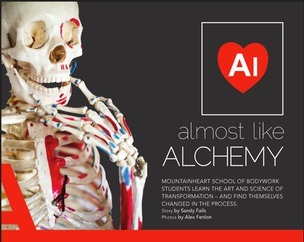 We at MountainHeart are excited to offer our 702 Hour CMT Program! It is a 3 day per week - 6 month program, with 7 Friday morning clinics. This allows new students a lower cost way to start their Massage Therapist career, as well as have more time for work, play, and studies. The 702 Hour CMT Program is derived directly from our 850 Hour CMT Program, and is an advanced basic, comprehensive, and integrated Massage Therapy program. This program integrates leading trends in massage therapy today; clinical neuromuscular/deep tissue/myofascial therapy, and effective Swedish massage. Our 702 Hour CMT program also exceeds the current national average in massage therapy education in order to start the therapist at the leading edge of the profession. Located in a sports-oriented mountain town, our 702 Hour CMT program offers may ways for the student interested in sports to align his/her work towards spa and sports massage. All our courses will provide time and experiences to allow the individual student to address their own areas of interest as they integrate their studies during case studies and feedback times. No prerequisites. greater skill and a greater chance of positive results.